Indonesian President Joko Widodo declared victory on Thursday in the race to lead the world's third-largest democracy, saying unofficial results showed his ticket had got 54 percent of the popular vote in Wednesday's election. Widodo ran with Ma'ruf Amin against former military general Prabowo Subianto, who secured 45 percent of votes, according to unofficial "quick counts" of sample votes by private pollsters. "We must wait for the official result. But 12 pollsters have given clear results...we convey that the Jokowi-Maruf ticket got 54.5 percent of the vote while Prabowo got 45.5 percent," Widodo told a news conference in south Jakarta. 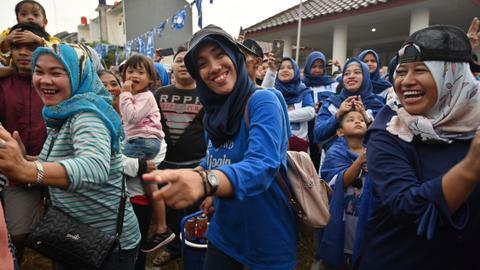 Prabowo has also claimed victory, citing internal polls as showing he won 62 percent of the vote. On Wednesday, Widodo said that "quick counts" indicated he had regained the presidency but called on his supporters to wait for the election commission to announce official results. Widodo is set to win the popular vote and is leading challenger Prabowo Subianto by between 7.5 and 11.6 percentage points, according to unofficial "quick counts" of a sample of votes by six pollsters. "Indications from exit polls and quick counts, we have seen all, but we must be patient and wait for the KPU's (election commission's) official tabulation," he told a news conference, during which he said the elections had been "honest and fair." Official results from the election commission are expected in May. TRT World's Natalie Poyhonen brings more from central Jakarta. Indonesians voted in one of the world's biggest one-day elections in a race to lead the world's most populous Muslim country. More than 190 million Indonesians cast a ballot as polls opened shortly after 2200 GMT (7 am Tuesday local time) in restive Papua. The vote ended at 0600 GMT (1 pm) in Sumatra at the other end of the volcano-dotted archipelago. TRT World's Natalie Poyhonen in central Jakarta reports on how the voting process unfolded. Opinion polls showed Widodo, 57, was a clear favourite but faced a tough challenge from Prabowo, 67, who has leaned on a fiery nationalist ticket and warned he would challenge the results over voter-list irregularities if he loses. Prabowo narrowly lost to Widodo in the 2014 elections, and unsuccessfully challenged those results. Voters flocked to more than 800,000 polling stations where they punched holes in ballots – to make clear their candidate choice – and then dip a finger in ink, a measure to prevent double-voting in a graft-riddled country where ballot buying was rife. The polls presented a huge logistical challenge in a country stretching 4,800 kilometres across more than 17,000 islands with a population of more than 260 million, including hundreds of ethnic groups and languages. Officials moved cardboard ballot boxes by motorbikes, boats and – as well as elephants and horses – to reach mountaintop villages and communities deep in the jungle. Raised in a bamboo shack in a riverside slum, the soft-spoken Widodo stands in stark contrast to Prabowo, whose strongman image is underscored by a penchant for slamming lecterns as he accuses Jakarta of selling the country off to foreign interests. 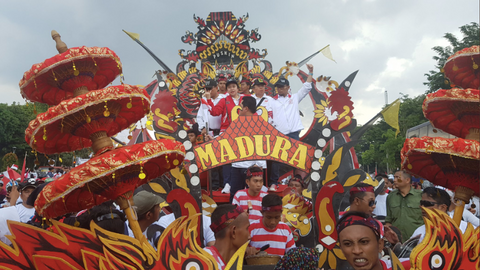 Prabowo – joined by running mate Sandiaga Uno, a 49-year-old wealthy financier – taking a page from US President Donald Trump, vowed to put "Indonesia first" by reviewing billions of dollars in Chinese investment. 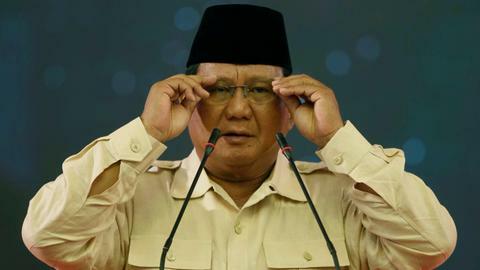 Prabowo's long-held presidential ambitions have been dogged by strong ties to the Suharto family and a chequered past.